The Vialone Nano "Gourmet Line" is grown in medium-textured soil (mixed sand) that is submerged in spring water to guarantee totally uncontaminated cultivation. Crop rotation is carried out on the land every four years. Characterized by chunky grains, this is excellent rice that absorbs seasoning and provides an ample amount when cooked. This rice is milled using mechanisms that are driven by a large, six metres in diameter, hydraulic wheel. Appreciated in ancient gastronomic tradition, this rice is suitable for risottos that are creamy and with well-separated grains. Ideal for gift boxes and Christmas baskets. Type of packaging: Canvas; 1000 gr. Packed in cartons of 12 or 20 pcs. The Carnaroli "Gourmet Line" is grown in medium-mix soil (mixed sand) that is submerged in spring water to guarantee totally uncontaminated cultivation. Crop rotation is carried out on the land every four years. 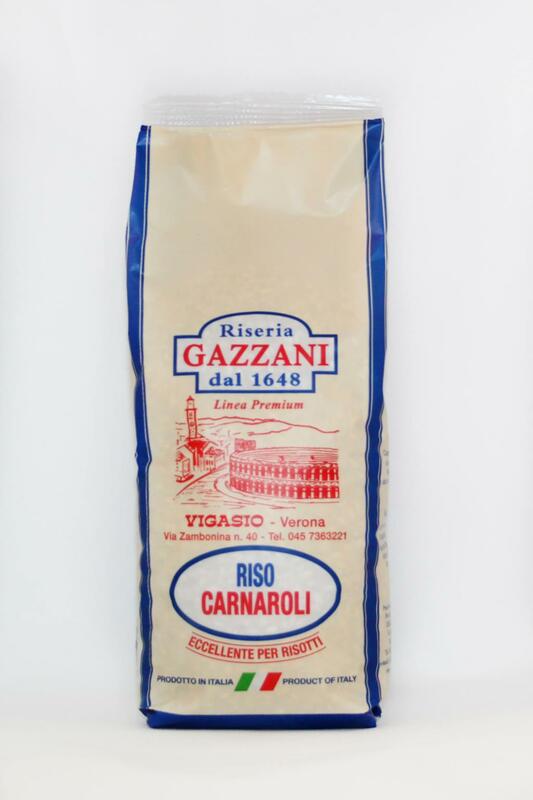 Considered as one of the best varieties of rice, and which retains form during cooking, carnaroli rice is ideal for fine risottos and special dishes. In fact, it is able to blend with, and enhance, the most diverse flavours. This rice is milled using mechanisms that are driven by a large, six metres in diameter, hydraulic wheel. Recommended for risottos, salads and for those with more demanding palates. The Vialone Nano "Premium Line" is grown in medium-textured soil (mixed sand) that is submerged in spring water to guarantee totally uncontaminated cultivation. Crop rotation is carried out on the land every four years. Characterized by chunky grains, this is excellent rice that absorbs seasonings and provides a good yield when cooked. The rice is milled using mechanisms that are driven by a large, six metres in diameter, hydraulic wheel. Appreciated in ancient gastronomic tradition, it is suitable for risottos that are creamy and with well separated grains. Cooking time: around 18 minutes. Type of packaging: Protective atmosphere; 1000 gr. 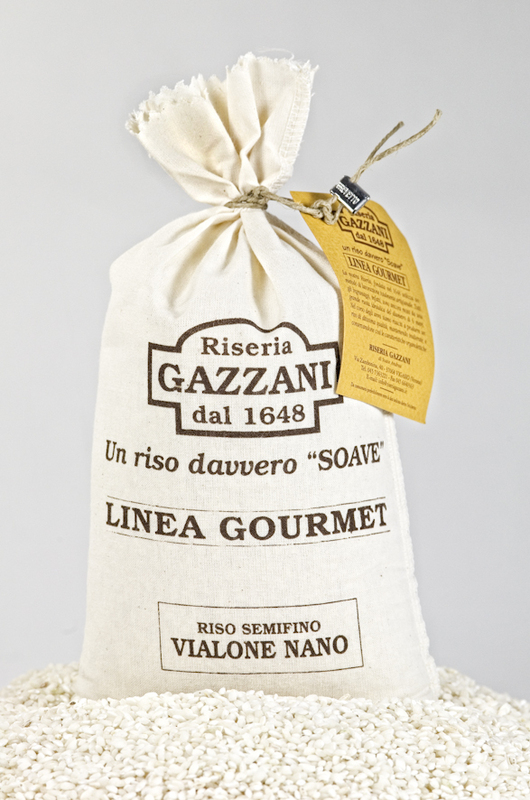 Carnaroli "Premium Line" rice is grown in medium-mix soil (mixed sand) that is submerged in spring water to guarantee totally uncontaminated cultivation. Crop rotation is carried out on the land every four years. 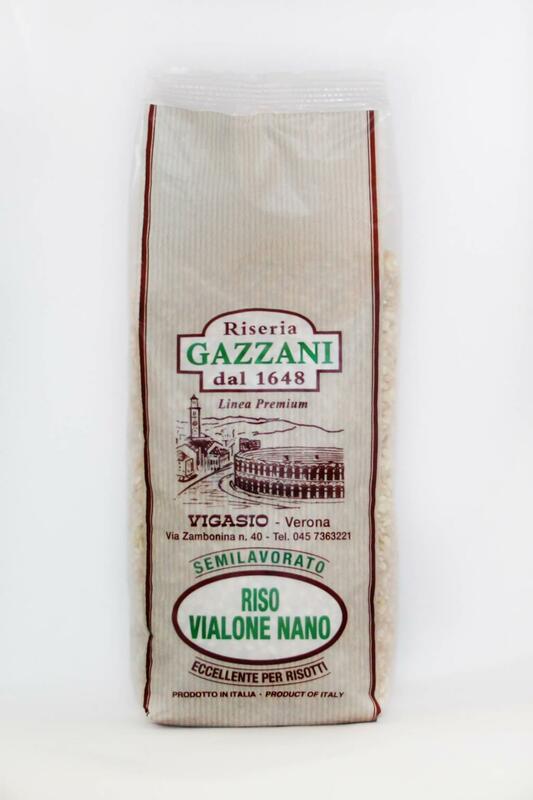 Considered one of the best varieties of rice, which retains form during cooking, carnaroli rice is ideal for fine risottos and special dishes. In fact, it is able to blend with, and enhance, the most diverse flavours. The rice is milled using mechanisms that are driven by a large, six metres in diameter, hydraulic wheel. Recommended for risottos, salads and for those with more demanding palates. 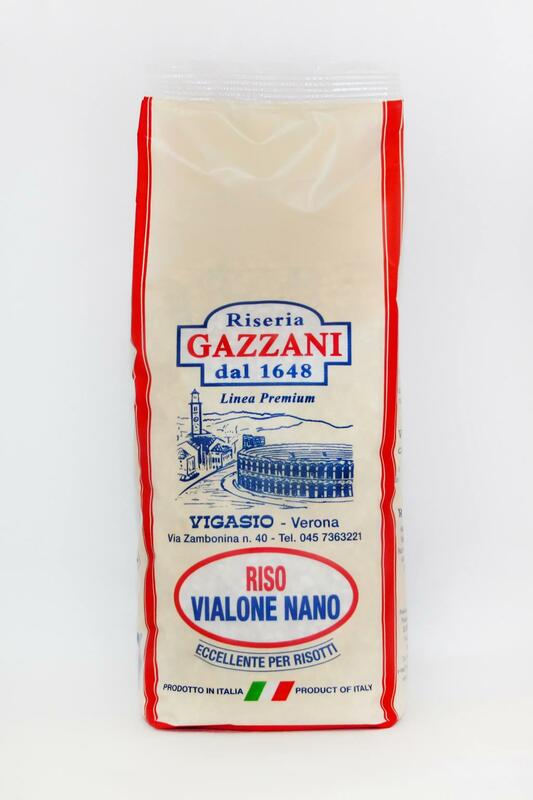 Vialone Nano Premium Line rice is grown in medium-mix soil (mixed sand) that is submerged in spring water to guarantee totally uncontaminated cultivation. Crop rotation is carried out on the land every four years. 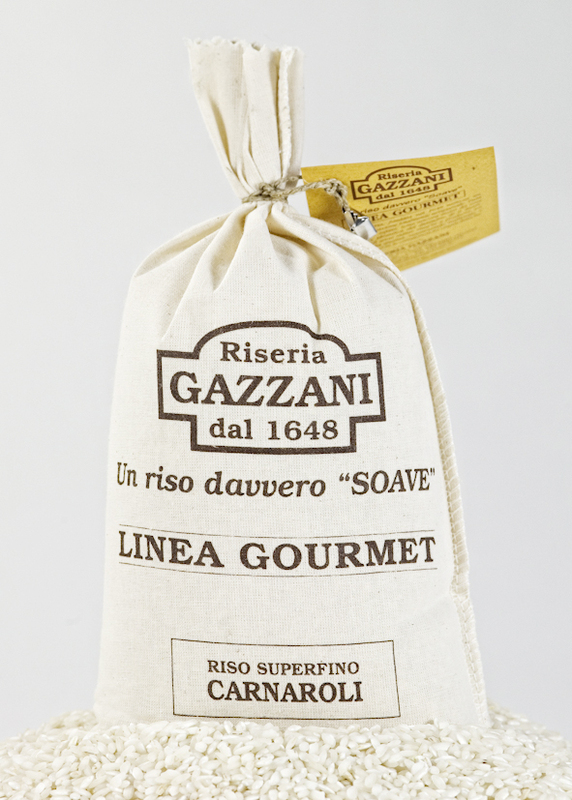 Characterized by chunky, dark and rough looking grains, this rice reminds us of the rice of old. In fact, the rice is milled using a totally artisanal method. All of the cogs used are still moved by a large, six metres in diameter, water wheel. This movement activates the ancient method of milling that utilizes PESTLES to rhythmically beat the rice without heating it. 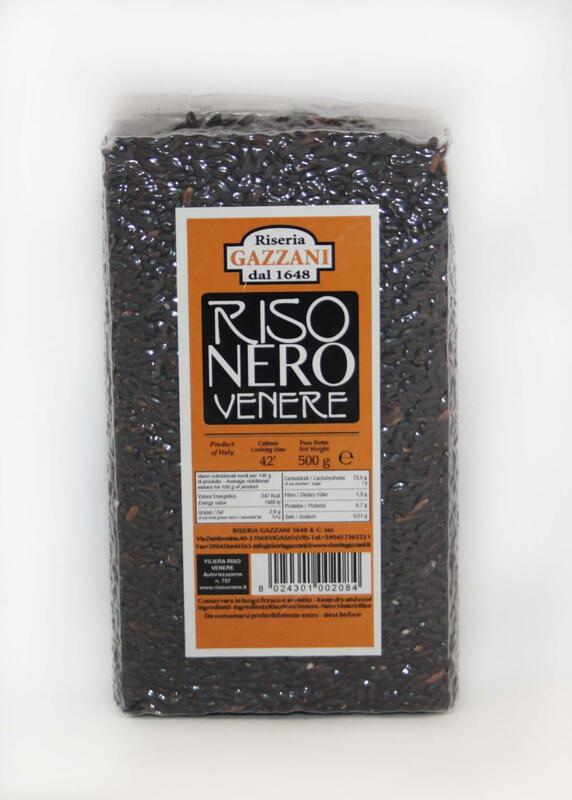 The final product is guaranteed unaltered organoleptic characteristics, which is excellent for risottos. Partially milled rice needs a few more minutes to cook. 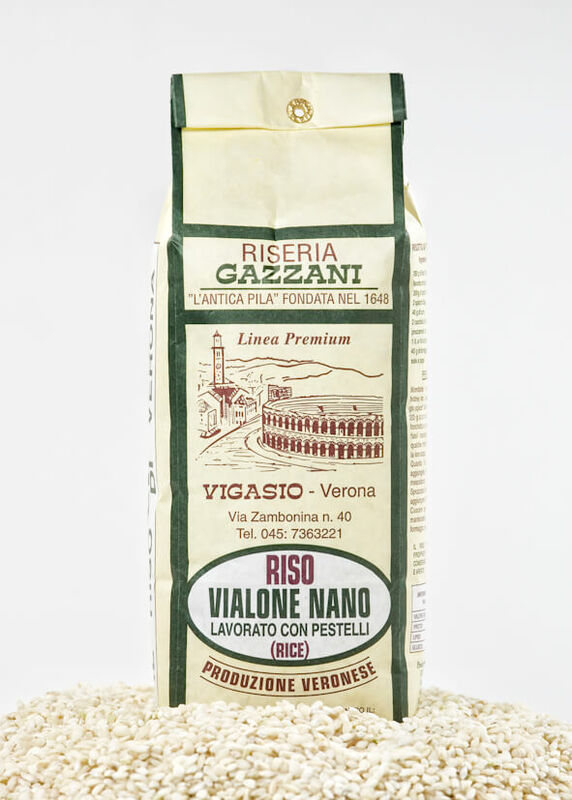 Ideal for risottos with well separated grains, pilaf rice, paella, and for those with more demanding palates. Cooking time: About 22 minutes. Type of packaging: Paper; 1000 gr. Packed in cartons of 12 pcs. The Vialone Nano "Premium Line" is grown in medium-textured soil (mixed sand) that is submerged in spring water to guarantee totally uncontaminated cultivation. Crop rotation is carried out on the land every four years. Characterized by chunky grains, this is excellent rice that absorbs seasonings and provides a good yield when cooked. Semi-milled rice is rich in fibre, maintains unaltered organoleptic characteristics, and has a more intense flavour. The rice is milled using mechanisms driven by the large, six-metres in diameter, hydraulic wheel. Cooking time: About 20 to 22 minutes. This was the first European black rice. It is original not only for its colour, but also for the notable aroma of sandalwood and freshly baked bread that emanates when it is cooking. Venere is a small, aromatic and very nutritious variety of rice. Compared to traditional varieties, it contains a greater quantity of proteins and minerals such as calcium, manganese, zinc and selenium. It can be cooked in the desired way (boiled, risotto, pilaf, soup), and is excellent creamed with fish or put together with meat or any other ingredient. Type of packaging: vacuum packed; 500 gr. Packed in cartons of 24 pcs.